Bill Gross meets a bear bond market. There’s no denying Bill Gross had quite a run. Known in finance circles as “the Bond King,” Gross co-founded Pacific Investment Management Company (or Pimco), an asset management fund known for its bond funds, in the early 1970s. His timing couldn’t have been better. The 1980s started a multi-decade bull market for bonds as rates fell for more than 30 years, sending prices soaring. 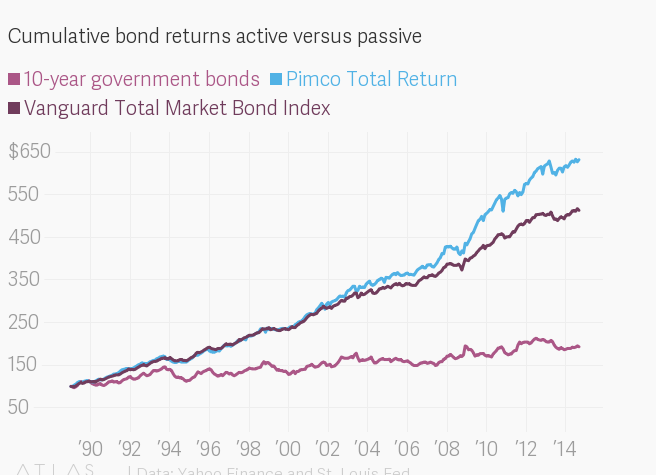 Nearly all bond investments made money, but Pimco’s Total Return fund did even better. The figure below shows the cumulative return for a 10-year government bond fund, the Vanguard Total Market Bond Index, and the Pimco Total Return Fund. Vanguard and Pimco’s funds took more risk than plain government bond funds by investing in corporate bonds, mortgages, and bonds from emerging market countries. 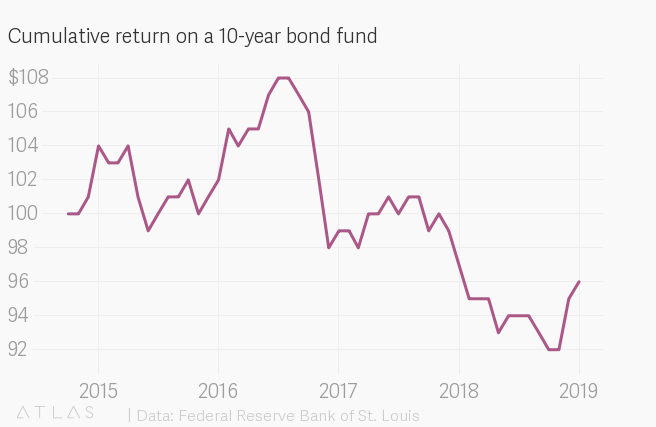 That extra risk is one reason why they outperformed 10-year US government bonds. But Gross’s Total Return fund outperformed even the Vanguard fund. Wall Street attributed the extra return to his investment skill. That could be. But his less-than stellar performance at Janus Henderson Group, where he landed four years ago after departing Pimco abruptly, led watchers to wonder if he’d lost his magic. He left Janus this week, announcing his retirement. It’s more likely that he never had much magic to begin with, and fell prey to what eventually takes down most active investors. His success coincided with an unusually prolonged bull market where bond prices consistently went up. In the last four years the bond market weakened and became more volatile. It is tempting to look at the performance of an active manager in one kind of market and assume they can always beat it. What takes a skill that few— and perhaps none—have is the ability to outperform in all market conditions. This is why academic finance economists generally recommend basing decisions on 50 years or more of data, and investing in index funds that track the market. There is no need to pay more for “market-beating ability” and over the long-run you’ll probably do better. Otherwise it falls on you to pick the right active fund manager every time the market changes.